There are some amazing Amazon Prime Day 2018 game Deals right now – including a whopping £600 off this fantastic Razer gaming laptop – but at the risk of stating the obvious not everyone has a spare £1599 to spend right now. I mean, you might not even have a spare £100. Or even enough for a cheeky Nandos, but… it's time to think strategically. Fast forward to a point when you will have cash to spend and will kick yourself for not picking up a PS Plus subscription for 50% off. Or when you're cursing your Nintendo Switch for a lack of storage space since you didn't pick up an official Micro SD card for the price of some socks. To save Future You from lamenting Current You's lack of foresight, we've pulled together all the best Amazon Prime Day 2018 gaming deals for under £50 (or significantly less). 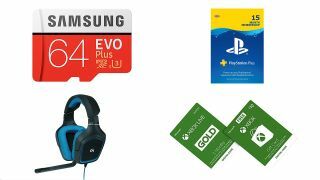 These are the discounted subscriptions, accessories and cases that every PS4, Xbox One, Nintendo Switch and PC owner will buy at some stage - and now is the right time to invest to make a longer-term saving.